Universiti Kuala Lumpur Business School is another pinnacle of success for Universiti Kuala Lumpur (UniKL) in its efforts to produce entrepreneurial graduates. The rebranding of Universiti Kuala Lumpur Business School has significantly enhanced the image of UniKL which has already been known for being a leader in technical education and striving to become one of the higher academic institutions that offer programs in Management and Business for both the graduate and undergraduate levels. Universiti Kuala Lumpur Business School was formerly known as the International School of Entrepreneurship or UniKL ISE. According to Prof. Dr. Sulaiman, the first Dean of Universiti Kuala Lumpur Business School, "Rebranding is another step towards realizing our vision to be a leading institution of higher learning that offers programs with the aim of producing entrepreneurs and professionals." Universiti Kuala Lumpur Business School currently offers highly qualified programs of study at UniKL Satelite Campus, located in Bangunan Yayasan Selangor, Kampung Bharu, Kuala Lumpur. With its campus strategically located in the heart of the city of Kuala Lumpur, it is also well-equipped with modern teaching and learning facilities. The school is continuously attracting many local and international students. Since its establishment in 2009, Universiti Kuala Lumpur Business School has developed programs of study that are unique and it focuses on the needs of the industry and national development. For example, with regard to the post graduate programmes that are offered, the first Dean, Prof. Dr. Sulaiman stated that "our MBA (Master of Business Administration) program is exclusively-designed to cater to working professionals or entrepreneurs around the Klang Valley. The program also provides excellent opportunities to those who wish to develop and enhance their expertise in managerial and entrepreneurial skills. Lectures are mainly held in the evenings. Students are allowed to choose from three modes of study i.e. full-time, part-time or modular. The school has held a strong international link with reputable institutions of postgraduate studies. In fact, the MBA programme is developed in collaboration with partners from Grenoble School of Management, France and the Asian Institute of Management (AIM), Manila. He further added, "In addition to MBA (Entrepreneurship), our MBA (Management) offers specialization in fields such as Aviation Management, Health Management, Tourism Management, Strategic Management and others. UniKL Business School is also one of the pioneering institutions that offer BBA in Islamic Finance. The Islamic Finance program is further strengthened with the cooperation of Islamic Banking and Finance Institute Malaysia Sdn. Bhd. (IBFIM) and the International Centre for Education in Islamic Finance (INCEIF). All educational programs of the university are approved and accredited by the Malaysian Qualification Agency (MQA). The school introduced several new programs in 2012 namely, Marketing, Tourism Planning and Management, Economics, and International Business. 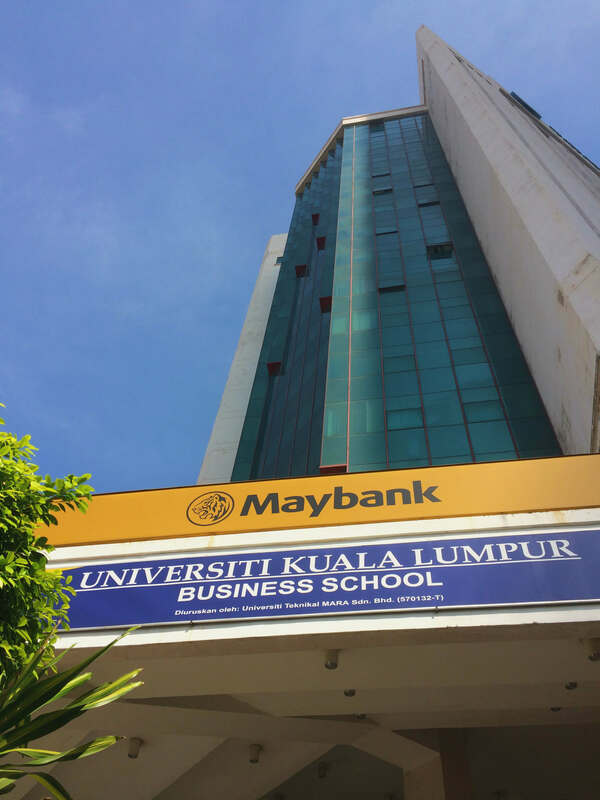 In order to continue its objective in providing top quality education programmes, UniKL Business School offered pre-university programs known as Foundation in Business and Management for the intake of May 2012. Pre-university programs were offered to students who excelled in their SPM to pursue undergraduate programs in Accounting, Management, Entrepreneurship and Finance. When asked about the future plans of UniKL Business School, Prof Dr. Sulaiman stated that, "we are planning to introduce and develop more unique and reputable programs for undergraduates; we are also aiming to offer many more value-added programs such as Professional Accounting AACA, CIMA, CA (Aust.) for our graduates." He also added, "UniKL Business School provides a conducive learning environment for students who prefer a unique learning environment with a difference. In UniKL Business School, the medium of instruction is English and this will encourage students to be exposed to the global environment in the presence of international students and 60 percent of lecturers with a Doctorate qualification. Concerted efforts are also taken to promote character building of students with the aim of producing future LEADERS ". UniKL Business School also focuses on research and development. Under the Entrepreneurship Research Centre (CERES), particular attention is given to research activities related to entrepreneurship. The School has a vibrant population consisting of staff and students who come from a wide range of backgrounds and are always willing to share their knowledge and expertise. UniKL Business School, at present, has a total of 3,100 students, comprising both local and international students. The university upholds the philosophy of continuing as the leading entrepreneurial technical university. This tenet is ascertained by the strong merge between the academic and the corporate world. Universiti Kuala Lumpur Business School was set up to meet global challenges by closely linking the institute with industry players to disseminate knowledge and experience through a variety of its educational programmess, research, training and consultancies. To be the preferred business school in the region. Towards producing top notch graduates who are committed and dedicated in the field of business and entrepreneurship.